These are guides for windows which can be raised and lowered. They come in various sizes, must be functional and hard-wearing, though subject to service condition such as as vibration, climate and aerodynamic effects. 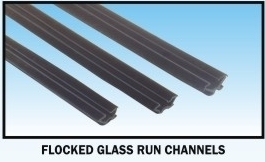 ASP channel feature excellent air and water tightness even when the window lowered or raided, and this very important in curved windows which are much used today in motor vehicles. The windows glass run channels are made with the very latest extraction methods and flocking.